I haven’t written a post about Solarvalue AG (XETRA:SV7) since Solar Grade Silicon roads lead to Ruše – Part 3. I did get to speak with Solarvalue’s Investor Relations contact, Maximilian Fischer, on Wednesday, March 14, 2007. While we had a nice chat, there was no post worthy, actionable information. Mr. Fischer verified the new arrangement with W&P Profil regarding the TDR facility was in effect a sale lease back type deal. I suspect there must be a major or catastrophic issue with the M5 arc furnace for a plan that requires a bearing assembly to be installed on M6. In truth, I verified the following information with an independent, confidential source. The M5 arc furnace is back in operation producing calcium silicon (CaSi 30) for W&P Profil. But it is possible M5 will be producing metalurgical grade silicon in 1-2 months. I will leave the speculation on this news to the readers of this Blog. What is up with the Solarvalue stock shares? It looks like the volume has dropped since the stock shot up from about €11 to €20 per share between March 5 and March 13, 2007. 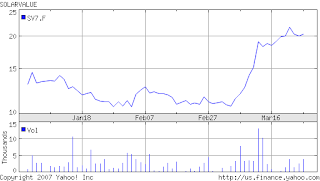 Will this stock price hold up when Solarvalue discloses financials for the year 2006 =in the first quarter of 2007=. I am surprised folks are bidding up the shares before Solarvalue obtains investment capital to finish equipping the Solar Grade Silicon (SGS) production facility at TDR in Ruše, Slovenia.